PRIDE AND PREJUDICE is one of those books I enjoy re-reading. At each stage in my life I find something new in the characters and the situations that I may not have appreciated previously. I also like some of the movie adaptations. 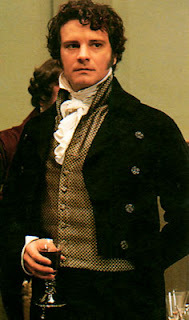 The BBC version is my favorite, but then I don't know many Austin fans who don't like Colin Firth's Mr. Darcy. (Yummy) I think Jennifer Ehle did a fantastic portrayal of Elizabeth too. Now, I've just discovered Theatre Calgary is doing a production of Pride and Prejudice in October / November. Excellent! Tickets don't go on sale until summer, so I've scheduled reminders in all of my calendars.